The Epiphone Company was founded in 1873 by Anastasios Stathopoulos and is one of American’s oldest and most revered instrument makers producing instruments for every style of popular music. In 1957 the company was bought by Gibson, its main rival in the archtop market. Epiphone instruments made between 1957 and 1969 were made in the Gibson factory in Kalamazoo and were effectively identical to the relevant Gibson versions, made with the same timber, materials and components and by the same people as the contemporary equivalent Gibson guitars. 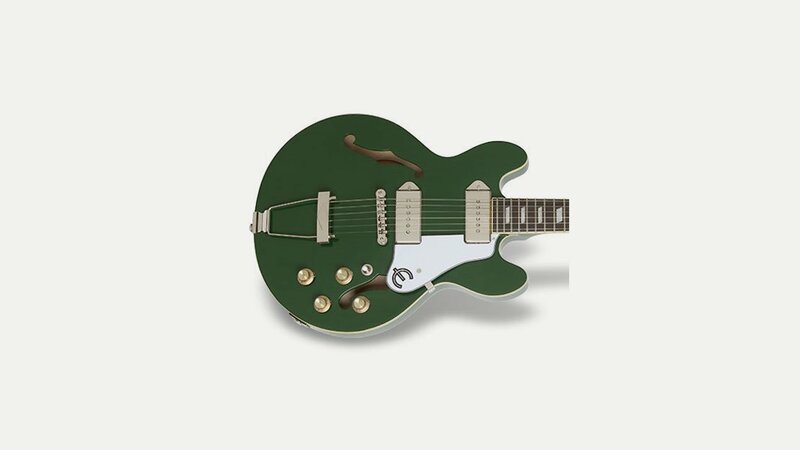 Examples include the Epiphone Casino (played by the Beatles and similar to the Gibson ES-330), the Epiphone Cortez (similar to the Gibson B-25), the Epiphone Olympic Special (similar to the Gibson Melody Maker), the Epiphone Sorrento (similar to the Gibson ES-125TC) and the Epiphone Texan (similar to the Gibson J-45. The other Kalamazoo-made Epiphones had a technical or cosmetic relationship with the similar Gibson version. In the early 1970s Epiphone began to manufacture instruments in Japan. From the 1980s Epiphones were manufactured mainly in Korea – Epiphone was primarily used to issue less expensive versions of classic Gibson models. Since 2004 they have mainly been manufactured in a dedicated factory in China, although the Elitist series are still made in Japan.